The proximity to the Liberia airport and a calm bay that offers various water sports and sportfishing are Playas del Coco’s major attractions, along with the short travel time to nearby beaches. Bosque del Mar is a small, eco-conscious boutique hotel situated right on the beach, in Guanacaste's stunning Papagayo Bay area. Playas del Coco is a quiet fishing town in the Gulf of Papagayo, nestled between Playa Ocotal and Playa Hermosa. Although millions of visitors flock to Costa Rica’s larger destinations, the quieter towns and villages often boast a unique charm that is difficult to match. One such town is Playas del Coco, nestled on the tranquil shores of the Gulf of Papagayo in Guanacaste. This laid-back fishing village has become more popular in recent years but still retains much of its heritage. For travelers who want to escape the hustle and bustle of everyday life, Playas del Coco hotels offer a true slice of Costa Rican life without compromising on comfort or luxurious amenities. 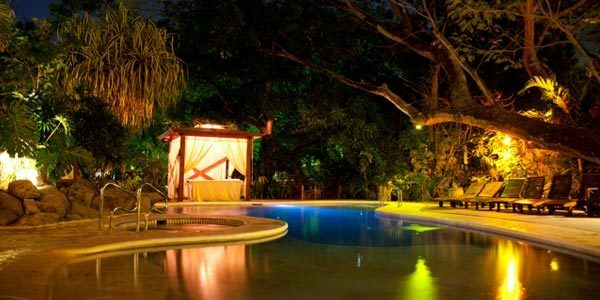 Combining the elegance and sophistication of a large 5 star hotels in Costa Rica but with the intimacy and atmosphere of a family-owned guesthouse, the Villa Buena Onda is one of the best Playas del Coco hotels in the region. With just seven suites, the service at this establishment is second to none, and the personalized attention you’ll receive as a guest will exceed your every expectation. Villa Buena Onda’s proximity to the ocean is just part of this magnificent hotel’s appeal. Sitting amid beautifully landscaped tropical gardens, each of the hotel’s seven suites boasts either a partial or full view of the Pacific Ocean, and is located just a mile away from Coconut Beach, one of the area’s most peaceful and secluded stretches of coastline. 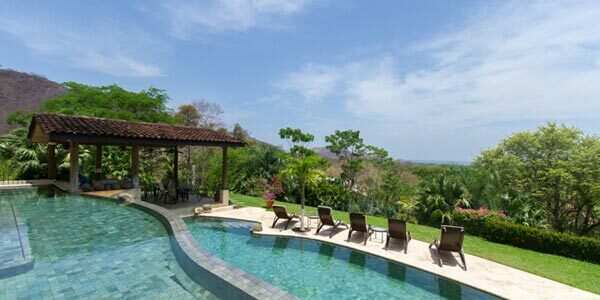 Despite its small size, the Villa Buena Onda offers guests the opportunity to indulge in some of the finest freshly prepared seafood in Guanacaste, which is best enjoyed from a private table overlooking the glittering waters of the Pacific. The two-tiered Infinity Pool overlooks the area’s amazing scenery, a sight that may make it difficult to leave the hotel grounds. Of course, when you’re ready to embark on your Costa Rican adventure, the hotel’s attentive concierge can arrange a series of exciting activities for you and your family, including sportfishing expeditions, canopy tours, rainforest hikes and scuba diving, to name a few. Villa Buena Onda also features a swim-up bar, allowing you to sip on a delicious cocktail or ice-cold beer while enjoying the delightfully warm waters and privacy of this stunning pool. Every suite has reliable wireless Internet access, as well as cable TV. One of the best Playas del Coco hotels in the area, Bosque del Mar is a nature lover’s paradise. Nestled amid swaying palm trees and immaculate tropical gardens, this establishment has 35 suites including a luxury penthouse, so whether you want to indulge in the very best or stay in more modest surroundings, Bosque del Mar is an ideal choice. As a beachfront property, Bosque del Mar is perfect for guests who want to enjoy the wide range of watersports for which Playas del Coco is famous. Sportfishing tours are especially popular in this area, as the waters of the Gulf of Papagayo are home to a variety of exotic and challenging fish, including striped marlin, Pacific sailfish, roosterfish and billfish. Even the most experienced angler will find their skills put to the test in Playas del Coco, as it is not uncommon for striped marlin to weigh as much as 270 pounds!